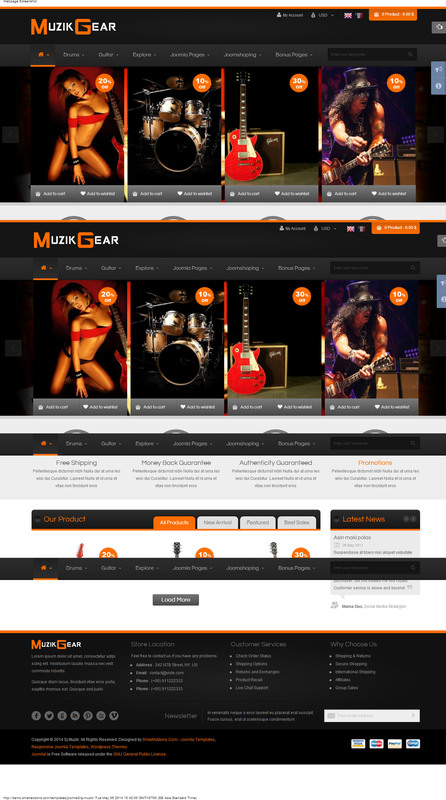 SJ Muzik - a pattern that has multiple functions, online store for CMS Joomla 2.5x, which uses for its operation component trade online JoomShopping. In his possession is five color schemes, three variations of the layout, which provide a clear demonstration of the goods on each resource page. The sample was created on YT Framework, responsible for the adaptation function allows you to configure the layout to fit the parameters, providing speed and other parameters. For display pages of the site, the template adds a variety of add-ons such as: SJ Content Related News, SJ Extra Slider, SJ Responsive Listing and others. SJ Muzik - is an excellent choice in creating an online store that promotes any type of goods, and provide him with excellent functionality.